THIS ARTICLE CONTAINS THE STATS, STRATEGY, AND GUIDE FOR CASTER - MEDEA. WE WILL UPDATE THIS AS SOON AS THE GAME COMES OUT. 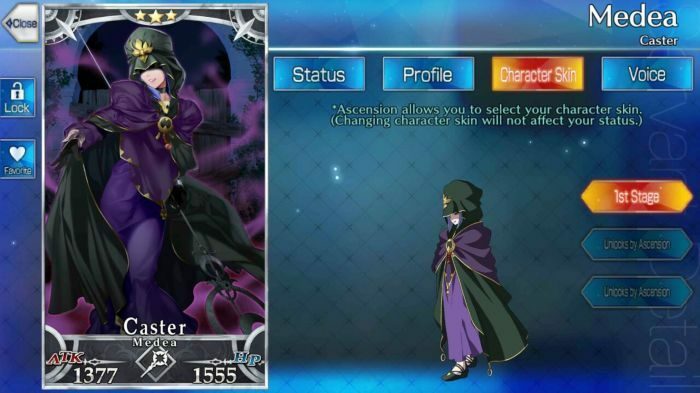 This article contains the skills, stats, strategy, and ability of Medea of the Caster class from Fate Grand Order [FGO]. Medea may have below-average stats, but she has unparalleled NP generation, letting her fire off her Noble Phantasm, Rule Breaker, again and again. She also has skills to charge NP for allies, allowing her to support them quite well. For her skills, Rapid Words of the Divine is one of the best for her build. At level 4, it can already charge her NP to more than 100%. Combined with Rule Breaker, which charges her own NP up to 100% at max level, she can just keep attacking enemies with her Noble Phantasm. If she will be taking on a more support role, Teachings of Circe can be used to charge the NP gauge of an ally by 30-50%. Her teammates will depend on what role you want Medea to perform in the party. If she is being used as a dedicated attacker, she will need defensive support. Jeanne d’Arc complements her perfectly in this regard. Teachings of Circe can remove Jeanne’s self-inflicted Stun from using her Noble Phantasm, while Jeanne can make the party invulnerable, or weaken the enemy’s Noble Phantasm. In return, Medea can focus on attacking repeatedly with Rule Breaker. On the other hand, if Medea will be supporting her party more, it’d be best if she can have strong attackers with her. Tamamo Cat is a good example. She has an incredibly powerful Noble Phantasm, but it has the drawback of leaving her Stunned. Therefore, Medea’s Teachings of Circe can remove this debuff, while charging her NP at the same time. Medea already has all the tools she needs to generate NP; what she needs, now, would be to maximize her damage output. Heaven’s Feel boosts her NP damage by a whopping 40-50%. Dragonkin is a weaker alternative, boosting it by 15-20%, but it’s a more common Craft Essence to come by. Craft Essences that boost Arts card performance would increase not only her damage output, but also her NP generation even more. Formal Craft is one of the best examples, strengthening Arts cards by 25-30%. Projection is a weaker, but more common alternative. Teachings of Circe A 1 8 Removes all debuffs on one ally. Increases their NP generation rate for 1 turn. Deals damage to one enemy. Removes their buffs.